VERDICT Talk about going out with a whimper… “And they all lived happily ever after as ghosts”? That's it? That’s the thrilling climax after 11 episodes (the last two of which were absolute humdingers)? Tut. With the small matter of the birth of the flippin’ Antichrist shunted to the sidelines for most of the duration, this finale feels strangely anti-climactic. Okay, “Afterbirth” isn’t as kick-the-screen-in infuriating as the finales of Lost or Battlestar Galactica , but that’s only because I had invested less viewing time in it. It’s hard to swallow the Harmons’ post-mortem contentment - they didn’t get along in life, so why would they be such a happy family in death? The way the scene shifts into dreamy blur-o-vision when Ben finally sees Vivien and Violet (and again later) is also extremely annoying. What’s that all about? It’s as if a new director has joined the show, missed a memo, and thinks you have to make everything look a bit weird whenever a ghost is on screen. And the speed with which Nora grows weary of caring for the stillborn baby rather serves to underline how utterly ridiculous that whole story strand was. This episode has just two things going for it: Ben’s shocking death by hanging, and the chilling three-years-later coda, where we see just how deadly Tate and Vivien’s evil offspring is. Otherwise it’s dreadfully disappointing. 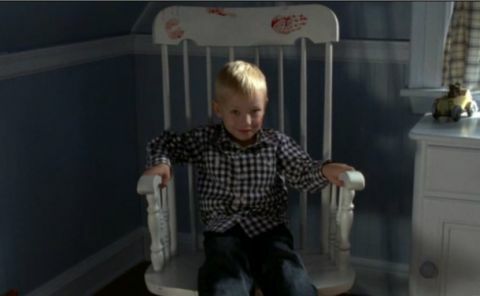 SPECULATION Ben’s line in the flashback about he can see a happier future unfolding in the Murder House “like a movie in my mind” does make you wonder whether the Harmons were somehow drawn to the house. CUTE MUSIC Lovely to hear the 1956 version of “Tonight You Belong To Me” by wholesome singing sisters Patience and Prudence. NITPICKS Why do the Harmons even bother scaring away the Ramos family? They’ll only have go through the same rigmarole again when another family move in. It’s incredibly convenient that Constance had a framed photo of herself and Tate on display all the time but no one spotted it before. What happened to Violet's corpse? Come to that, did anyone ever come looking for that pest control guy that Tate murdered in episode ten? Presumably his van is still parked outside! And where the hell did the Harmons get that Christmas tree from? It’s not like they can pop down to the local garden centre and buy one, is it? WHERE NEXT? So where the hell will American Horror Story go for its second season? Well, thanks to co-creator Ryan Murphy we know it’ll leave the Murder House behind. He also teased “There’s a clue in the last three episodes where we say what the second season will be.” If there is it passed me by. Anyone got any ideas? It might provide a satisfying sense of continuity if season two kept the anti-Christ storyline rolling, but to be honest I could do without seeing another replay of The Omen . In fact, I’m kinda hoping that series two won't feature ghosts either. And it’d be very cool if there’s a new role for Jessica Lange. Given that she’s just won a Golden Globe, you’d think they would be desperate to keep her on-board - fingers crossed. American Horror Story airs in the UK on FX.